Toyota Innova Crysta & Fortuner get UPGRADED: Prices hiked! Toyota’s best-selling cars – the Innova Crysta MPV and the Fortuner luxury SUV – have received a host of new features. Prices of both the MPV and SUV have also risen thanks to the feature additions and the new mandatory third party insurance (for three years). Prices of the upgraded Toyota Innova Crysta start from Rs. 14.65 lakhs and prices of the Fortuner now start from Rs. 27.27 lakhs. The upgrades and new insurance regulations have resulted in the Innova Crysta getting pricier by about Rs. 30,000 to Rs. 64,000. As for the Fortuner, it’s gotten pricier by about Rs.60,000. The upgraded Toyota Innova Crysta gets the following feature additions as standard across variants: Emergency brake signal which turns on hazard lamps, rear fog lamps, front LED fog lamps, anti-theft alarm with glass break and ultrasonic sensor. The GX variants of the MPV also receive a touchscreen infotainment system, steering-mounted audio controls, power-folding wing mirrors with puddle lamps and a speed- and impact-sensitive door lock/unlock feature. 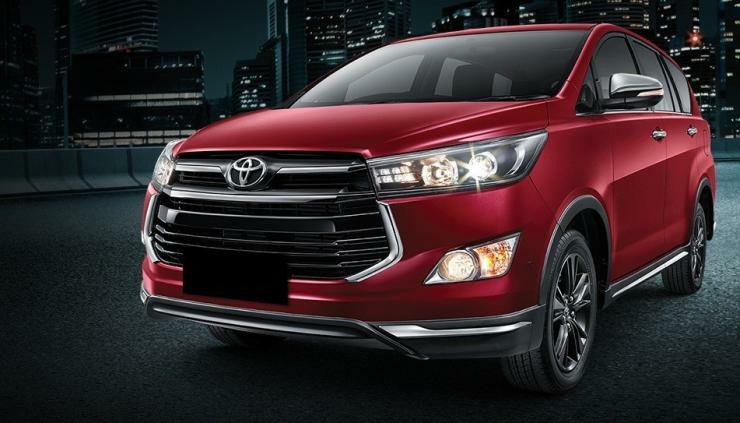 As for the Toyota Fortuner, the upgrades across the range include a passenger side powered seat, anti-theft alarm with glass break and ultrasonic sensor, emergency brake signal that turns on hazard lamps automatically, rear fog lamps and an electrochromatic inner rear-view mirror (IRVM). Both the Innova Crysta and Toyota Fortuner sold in India get a range of petrol and turbocharged diesel engine options. The petrol engine is a 2.7 litre, naturally aspirated unit, with 164 Bhp-245 Nm on tap. 6 speed manual and automatic gearboxes are on offer with this engine. The Innova Crysta gets 2.4 litre and 2.8 litre turbocharged GD diesels with 148 Bhp-343 Nm and 172 Bhp-360 Nm outputs, respectively. The smaller engine gets a 6 speed manual gearbox while the larger motor gets a 6 speed automatic. The Fortuner is sold with a 2.8 litre turbocharged diesel motor in the 175 Bhp-450 Nm state of tune. This motor gets 6 speed manual and automatic gearbox options. A 4 wheel drive mode is also on offer.